One of the most significant new features of Lion is one I hope you’ll never need to use: recovery mode, officially called "Lion Recovery." It turns out that when you install Lion, the installer creates an invisible, bootable, 650MB partition—a portion of a drive the operating system treats as a separate volume—on your startup drive called Recovery HD that includes a few essential utilities for fixing problems, restoring files, browsing the Web, and even reinstalling Lion. The idea behind recovery mode is that if you ever have problems with your Mac’s startup volume, you can boot from Recovery HD and perform some basic troubleshooting procedures without the need for an OS X installation DVD (or, in the case of early MacBook Air models, the installation thumb drive) or a separate bootable hard drive. Unfortunately, because the Recovery HD volume is read-only, you can’t, say, copy your favorite third-party disk utility onto it to make that utility available in recovery mode. However, because Recovery HD is a separate partition—and one that’s invisible even to Disk Utility—even if you were to erase your Mac’s hard drive, recovery mode would still be available at startup. Of course, because the Recovery HD partition is actually part of your Mac’s internal hard drive or SSD, if that drive is having hardware problems, or partition-map problems, the recovery partition itself may be inaccessible. In other words, recovery mode won’t save you from every problem, and it’s no substitute for having a reliable, regularly updated backup. The easier way On newer Macs, you can access recovery mode by simply restarting or starting up the Mac and immediately holding down Command+R. Keep holding these keys until you see the Apple logo on the screen. After a few seconds, you’ll see a window with Mac OS X Utilities in large text across the top. If this procedure doesn’t work for you, try the second method. Hold Option at startup, and you can choose to boot from the new Recovery HD volume. Restart or start up your Mac and immediately hold down the Option key; keep holding Option until the Startup Manager—a gray screen showing all connected, bootable volumes—appears. One of the volumes will be called Recovery HD. Select Recovery HD and then click the upward-pointing arrow below it to boot from Recovery HD. After a brief delay, you’ll see the new Mac OS X Utilities screen. Recovery mode offers a number of useful troubleshooting options. Regardless of which method you used to access recovery mode, the menu bar displays OS X’s Input, Wi-Fi, and (on laptops) battery menus. If you want to connect to your network or the Internet, and you haven’t already chosen a Wi-Fi network, you can do so using the Wi-Fi menu. Alternatively, if you’ve got a wired connection, be sure the Ethernet cable or USB-to-Ethernet adapter is connected to your Mac. When booted into recovery mode, the tasks you can perform are limited. The four main options are listed in the Mac OS X Utilities window; select one and click Continue to use it. Restore From Time Machine Backup: You have a backup of your system that you want to restore. If the problems your Mac is having are serious enough that you need to erase your startup drive (perhaps using Disk Utility in recovery mode, below), or if you’ve installed a new hard drive in your Mac, this option lets you restore, from a Time Machine backup, your entire system, including the OS and all accounts, user data, and settings. Note that to use this feature, your Time Machine backup must be a complete backup that includes all system files. So if you previously added the System folder, or any other OS-related files and folders, to Time Machine’s exclusion list (in the Time Machine pane of System Preferences), you won’t be able to restore your system from that backup. Instead, you’ll need to reinstall Lion (see the next item) and then use Lion’s Setup Assistant to transfer your data from your Time Machine backup. Before proceeding, read the important information on the Restore Your System screen that appears when you choose this option. Specifically, note that the Restore From Time Machine Backup feature erases the destination drive—it’s only for restoring an entire volume from a Time Machine backup to its original source (or to a replacement drive). To transfer files from a backup to a new Mac, you should use Migration Assistant or Setup Assistant; to resture individual files and folders, use Time Machine while booted into OS X. You can restore from a Time Machine backup from within recovery mode. 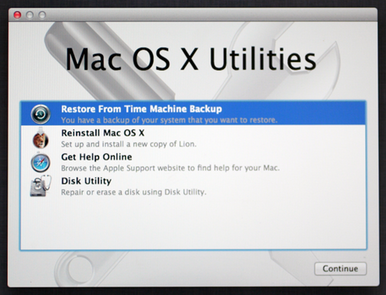 If you’re sure you want to use the Restore From Time Machine Backup feature, click Continue. On the next screen, you select your Time Machine drive, then the particular backup snapshot you want to restore from, then the destination drive. You’ll see a final warning that this procedure will erase the destination drive; click Continue, and the drive is erased and the utility begins restoring your files from your Time Machine backup. Once this process is finished—on a MacBook Air, it took about an hour and a half for approximately 63 GB of data—your Mac will restart from the newly restored drive and you’ll be able to log in normally. Reinstall Mac OS X: Set up and install a new copy of Lion. 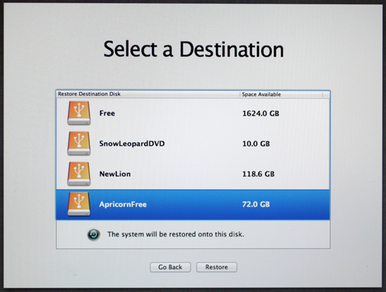 Select this option and click Return, and the Lion installer launches, letting you install Lion on any supported drive or volume, including the current Mac’s internal drive. However, this version of the installer doesn’t actually include all of the necessary files and data, so installing Lion from within recovery mode requires an Internet connection to download the actual OS. While it’s nice to have the option to install Lion from within recovery mode, because of this download-the-whole-OS drawback, I recommend doing so only if you don’t have a bootable Lion-installer drive. Get Help Online: Browse the Apple Support website to find help for your Mac. Choosing this item and clicking Continue launches Safari (with default settings and bookmarks) to let you browse Apple’s Support site, or any other website, to find answers to troubleshooting problems. You can also check and send email if your email account provides Web access. When Safari first launches in recovery mode, you’ll see a page called Recovery Information that provides (brief) instructions on how to perform various tasks in recovery mode. Unfortunately, you won’t be able to print these instructions from within recovery mode, although you can access them when booted from your standard startup drive—see “Recovery HD under the hood,” below. Disk Utility: Repair or erase a disk using Disk Utility. Selecting this option and clicking Continue launches Disk Utility, which you can use to check, repair, erase, or partition connected drives. You’ll even be able to repair your Mac’s normal startup volume, although you won’t be able to repartition your Mac’s internal drive, since you’re actually booted from it. If you decide to erase your Mac’s startup drive and reinstall Lion (after making sure you’ve backed up, of course), you’d start here, erase the drive, quit Disk Utility, and then use the Reinstall Mac OS X option (above) to install a new copy of Lion. You can get back to the Mac OS X Utilities window at any time by quitting Disk Utility. In addition to the four options in the Mac OS X Utilities window, recovery mode also offers a few options in its Utilities menu (displayed when viewing the main Mac OS X Utilities screen): Firmware Password Utility, Network Utility, and Terminal. These are the same utilities you can use when your Mac is booted normally into OS X; they let you configure a firmware password, monitor network connections and traffic, and use OS X’s Unix shell, respectively. 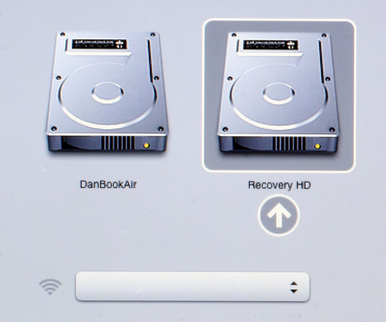 If you try to find the Recovery HD partition in the Finder, or even using Disk Utility, you’ll come up empty. Apple’s hidden this partition well, presumably to keep it safe from accidental (or intentional) modifications—after all, what good is an emergency disk if someone has accidentally deleted some of its vital contents? However, if your curiosity won’t be sated until you’ve been able to browse Recovery HD, here’s how. Just remember: Look, but don’t touch. 1) Open Terminal, type diskutil list, and press Return. 3) Locate the Recovery HD partition (under Name) and note its identifier—in my case, disk0s3. 4) Type diskutil mount [identifier], where [identifier] is, of course, that identifier. This mounts the Recovery HD partition in the Finder. Inside should be a single folder, named com.apple.recovery.boot. drwxr-xr-x  10 root  wheel        340 Jul 20 07:54 .
drwxrwxr-x   8 root  wheel        340 Jul 20 07:54 ..
Of particular interest is BaseSystem.dmg, a disk image that contains the recovery partition’s bootable copy of OS X and all the recovery-mode utilities. You can mount this disk image in the Finder by typing open /Volumes/Recovery\ HD/com.apple.recovery.boot/BaseSystem.dmg and pressing Return. Once you’ve done that, you can view the Recovery Information page you see when you launch Safari from within recovery mode; just type open /Volumes/Mac\ OS\ X\ Base\ System/System/Installation/CDIS/Mac\ OS\ X\ Utilities.app/Contents/Resources/English.lproj/ (all one line) and press Return. You’ll see the contents of the English.lproj folder; find the file RecoveryInformation.html and double-click it to open it in your default Web browser. When you're done browsing, you can eject Mac OS X Base System as you would any removable volume. You can then unmount the Recovery HD volume by typing diskutil unmount [identifier], where [identifier] is the same identifier you used above. Updated 7/20/2011, 11am to include the actual time it took to download the Lion-installer data in recovery mode, to update the instructions for viewing the contents of Recovery HD, and to include instructions for unmounting Recovery HD. Updated 2/10/2012 with new information about Lion Internet Recovery compatibility.